I’m sure this will become a new internet or blog meme. Bioemphemera (aka Jessica Palmer) has a post describing the top google suggestions for ‘are scientists’ and ‘do scientists’, shown using a lovely infographic. Do check it out. 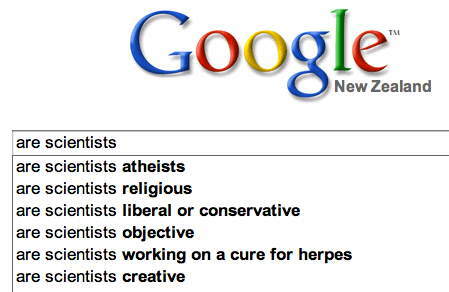 As Jessica pointed out on her blog, cures for sexual transmitted diseases must be an eternal question! Maybe it’s just me, but I find most of the suggested phrases negative, or at least seem strange given that most have obvious answers. It’s bit sad, really. (Quickly, for ‘do scientists’: most don’t, no, yes, yes, no, no, yes, all but a very few don’t and those that get caught get punished, yes, geologists do.) Maybe the largest group of internet users are young kids? It would be appalling to think this reflects most adults’ understanding of scientists. It reminds me that I must see the movie, which Jennifer Rohn rates as representing science in a good light, despite the nutty premise of the movie: ’[…] Instead, this time, science gets to be the good guy overall […]’. 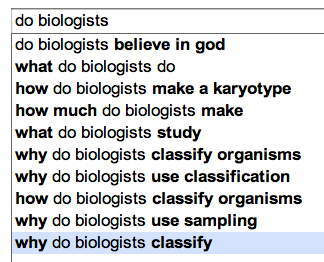 The fourth one (‘how much to biologists make’) strikes a chord… If you try different branches of science (physicists, zoologists, etc.) you’ll find how much they earn is a common query. 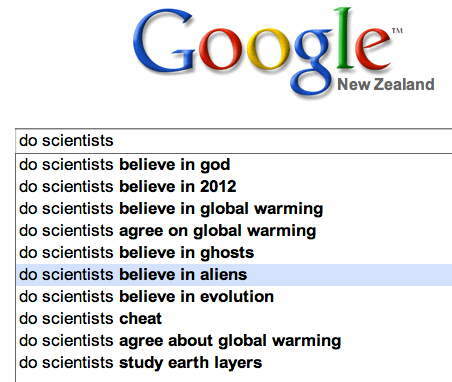 Maybe it’s the recent large earthquakes, but geology comes to the fore in queries starting with ‘how scientists’. Try out some yourself and let us know what you find. That should keep you busy for a bit! I don’t know if the different results reflect some time having past, or that I’m using Google New Zealand or perhaps both; Jessica Palmer used the American site. The inheritance of face recognition, or should you blame your parents if you can’t recognise faces? I agree. I should have picked up on that! I had little doubt that the general thing wasn’t new: itâ€™s too obvious to not have already been done! I actually thinking about science blogs and how memes tend to spread through the science blogs networks; if you follow themâ€”as I doâ€”frequently a topic spreads around the science blogs and this struck me as one that would be likely to do that. It also deals with quite a few of the terms that these google suggestions bring up, putting them in the right context for science.